Urban Myths. No.1: The Supermarket Spider. 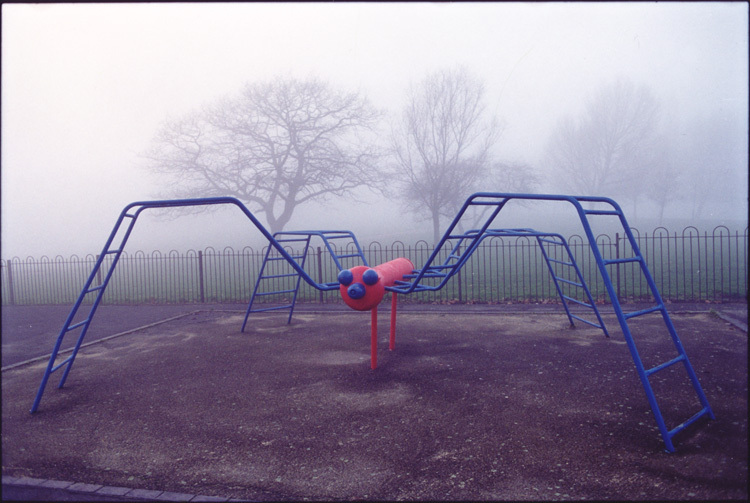 Posted: February 9, 2013 | Author: thelondoncolumn | Filed under: Amusements, Parks, Wildlife | Tags: climbing frame, Hillyfields, spider in bananas, spider in supermarket | Comments Off on Urban Myths. No.1: The Supermarket Spider. Hillyfields, Lewisham. Photo © David Secombe 1999. WHEN Heidi Slopes did her weekly food shop she picked up an innocent looking pack of bananas – little did she know that between the yellow fruit lurked a nest of spiders. The 53-year-old, who is scared of spiders, had the shock of her life when she spotted the white furry eggs. Heidi wanted to get the suspicious package checked out, and after a phone call to health and safety at Lewisham council she was advised to take them back to the supermarket. “It took almost five hours of numerous phone calls to get hold of someone at the store, only to be told that I would need to bring the packaging and the receipt in for a refund,” said mother-of-three Heidi. RSPCA animal collection officer Terence Whipps subsequently confirmed that the eggs were those of the Brazilian Wandering Spider, listed in the Guinness Book of Records a the most venomous animal in the world. It’s scientific name is Phoneutria nigriventer – the first element is Greek for ‘murderess’ – but it is also known as the banana spider because of its habit of stowing away in shipments of the fruit. A supermarket spokesman said: “We want to reassure customers this was a very unusual and rare occurrence and we are really sorry for what must have been a real scare”.